Link juice might sound like something you can order off the drinks section of a menu, but in the online world it’s so much more than that. It’s a term used in SEO to refer to the amount of value a link passes on to the receiving webpage. You might have heard of it being called “link equity” - which is the same thing - and it’s one of the biggest factors in Google’s ranking algorithm. In the most simplest of scenarios, backlinks from websites with a higher authority and that are relevant to the website being linked to transfer more link juice which, in the long run, helps the receiving page rank higher in search engines. There’s actually a little more that goes into it than this, though. In fact, there are a number of important factors that help calculate how much link juice is transferred from one page to another. How Do You Measure the Juicy-ness of Link Juice? Like most things, not all links are equal, and some don’t generate any link juice at all. For the most part, it’s safe to assume that links from well-known websites that have a high authority are viewed as more trustworthy in the eyes of Google and, therefore, pass on more link juice. The amount of link juice passed on varies, and is dependent a number of key factors. As we mentioned just a moment ago, links from websites that are authoritative in their niche are more likely to pass on more link juice than those that are new or less-established. For example, a link from Forbes or the New York Times is going to be worth a lot more than a link from a small local business website. The anchor text is the hyperlinked text that you click on to go to the linked website. Google (and other search engines) use this text to determine what the linked webpage is about. For example, if the anchor text says “best fishing equipment”, Google will assume that the page is about - you guessed it - fishing equipment. It’s important that the anchor text is relevant to the webpage being linked to, but don’t stuff it with keywords or make it extremely long. Short, sharp, and relevant is the way to go. While it might be tempting to get links from all sorts of websites, this can actually do more harm than good. Relevance is key in building trust with Google and proving that your webpage is a valuable resource for users. For example, if your product is a a time tracking app and you have a link from a fishing website, that’s not going to hold much value. On the other hand, if you have a link from another time tracking app or an authoritative productivity tool, that’s going to hold a lot more weight. Relevance often trumps the authority of the website, too. Getting a highly-niche link from another time tracking app is often worth more than a link from an all-rounder site like Forbes. You’ve probably heard of the whole “no-follow or do-follow” debacle. This whole concept was introduced as a result of search engines tiring of people paying for links that weren’t natural. Essentially, a no-follow link tells Google bots to not follow the link to its destination, usually because it’s not relevant or a shady. As a result, it doesn’t transfer any link juice. So now you’re ready to get some of that link juice, here’s how you can do that. This is when an external website links to yours, which is easier said than done as high-authority websites tend to be strict on who they link out to and pass their link juice onto. There are a few ways you can start building your external links up, though. Writing and publishing posts on external, relevant websites is a great way to get link backs. Not only will it expose you to a new audience (which is always a win-win situation), you’ll usually get a link back in the author bio or somewhere in the piece. This gives you a chance to share your expertise and provide value to the reader while also getting some of that tasty link juice. Publishing something like an industry report or an epic guide or tutorial gives external sites something of substance to link to. You’re more likely to get links to meaty pieces of content than sparse 500-word blog posts that don’t provide much value. Roundup posts are some of the most linked to posts in the blog-o-sphere. They essentially bring together a list of tips, quotes, stories from authorities in your industry who might then link back to the piece from their own sites. “Give out to get back” is the motto to live by when it comes to link juice. The more you link out to relevant, useful webpages, the more likely they are to link back to you. 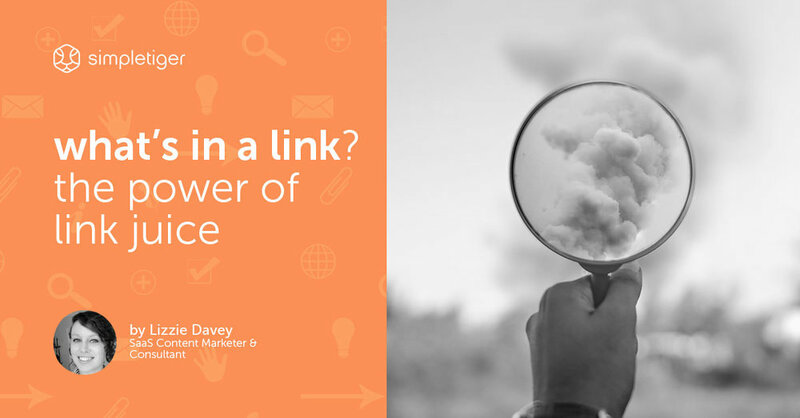 The second way to bottle up link juice is to link internally between your own blog posts and webpages. This shows search engines the hierarchy of your site and links together relevant topics to give them a better understanding of the value your site can offer. If you’ve got hundreds of blog posts it can be difficult to know where to start with internal linking. It can really help to draw out a map of your site with all your posts and pages, and then start making connections between them. For example, if you have a series of blog posts about productivity and you sell a time tracking product, make sure those blog posts link to the time tracking product page. Some blog posts are more valuable than others. For example, if you have a beefy guide on top productivity methods that already gets a lot of traction from the search engines, make sure you link out from it to all the other, smaller blog posts you have about productivity. This will pass on some of the link juice the bigger guide has to the smaller blog posts and boost their rankings. Ready to Bottle Up That Link Juice? It’s simple, really: the more links you have coming into your site from high-authority, relevant webpages, the more emphasis search engines will place on you when it comes to ranking. Once you start working on your internal linking structure and building a network of links coming in from other sites, you’ll start to creep up the search engine rankings which will lead to more traffic, more conversions, and more customers.